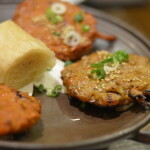 For those interested in traditional, authentic Jeju cuisine without having to travel all the way to the island, I highly recommend a place near Hongdae called Tamra Sikdang. Owned and operated by a native Jejuian/Jejuite(? 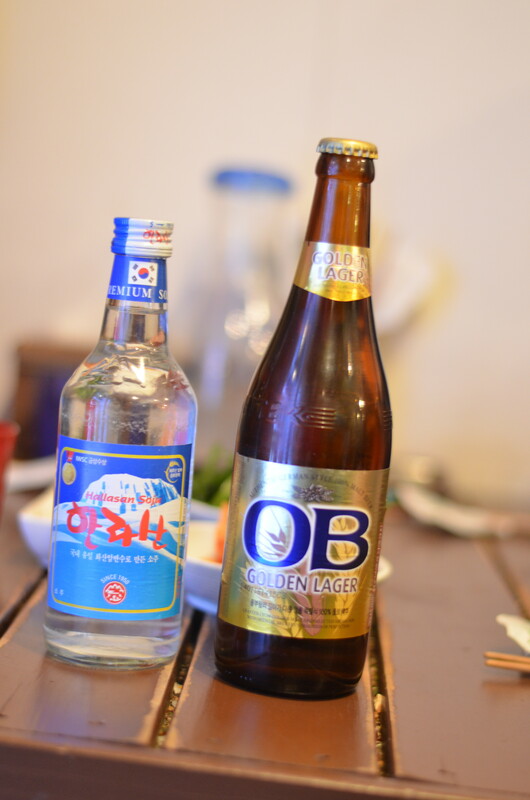 ), they’re one of the few restaurants to source all of their ingredients and inventory from the island, which I must say is pretty impressive. 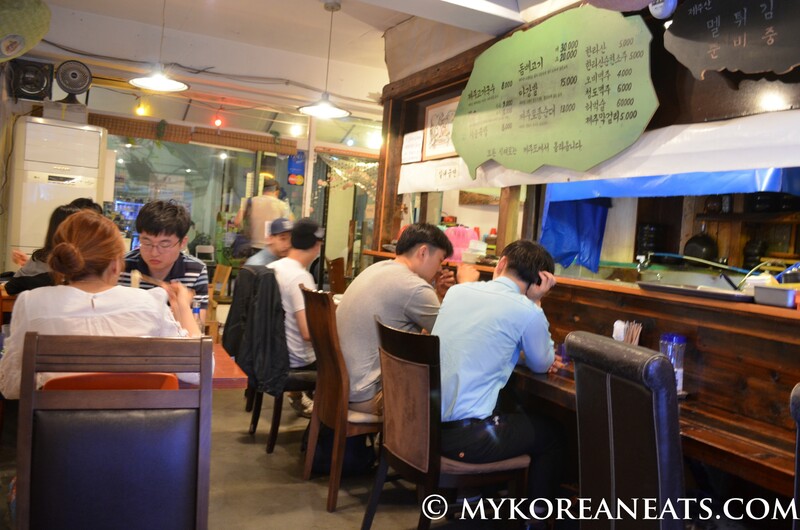 They serve old-school dishes like Momguk 몸국 (Mojaban Gulfweed Soup), Gogi Guksu 고기국수 (Pork n Noodles in Milky White Broth), Dombae Gogi 돔베고기 (Jeju-style Bossam), and a few other local goodies like Soondae (Blood Sausage) and Hallasan Soju (sweet!). With a friendly recommendation, our group chose the three aforementioned dishes and were pleasantly surprised with each one. The Momguk was pretty thick, slightly gelatinous (most likely from the Mojaban seaweed), and had a nice balance of flavors. 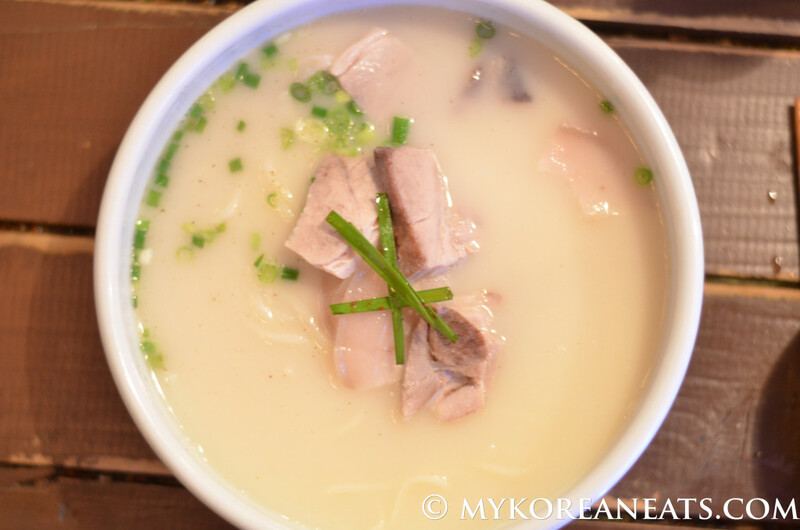 As for the Gogi Guksu, it was essentially Seolleongtang with more noodles and chunks of Jeju pork in a mild pork broth. 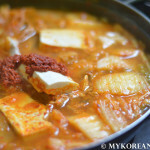 Being a big fan of Seolleongtang (Beef Bone Soup), this was a winner for me despite its simplicity. Lastly, the Dombae Gogi was your basic fare of bossam/suyuk (boiled pork) except using Jeju pork—super soft, nicely presented, and perfect with the Hallasan soju. 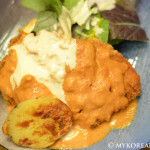 As with most old-school Korean dishes, there was nothing fancy or pretentious about the food, but instead offered something that fancier food could never provide—warmth, comfort, and soul. Just an interesting side note. The restaurant makes an appearance in a Korean movie called Santa Barbara (산타바바라). My girlfriend and I barely noticed it until we saw their cute menu shaped in the form of Jeju Island. Needless to say, if it weren’t for the movie, this review would have been lost just like the others. Another side note but not so funny. The place is not that big (can’t be more than 20 seats total) but has gained quite the following. Expect a lengthy wait during peak hours so make sure to get there early. Or if you don’t mind the wait, go grab a drink at one of the many “cool” cafes in the vicinity. 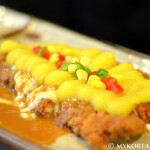 Dombae Gogi (aka Suyuk) @ 20,000 won. 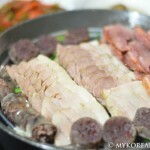 Gogi Guksu (“Meat Noodles”) @ 8,000 won. 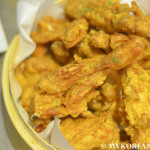 Momguk (Mojaban or Gulfweed Soup) @ 9,000 won. 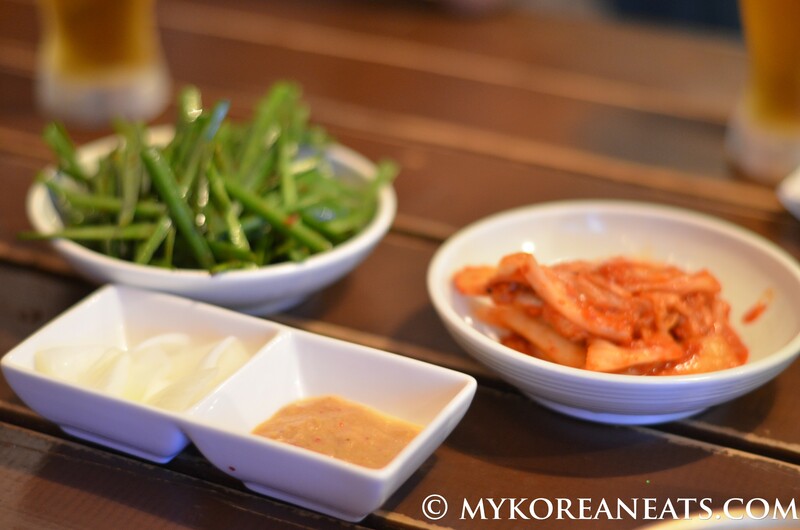 Basic banchan of kimchi, seasoned chives, and dipping sauce. 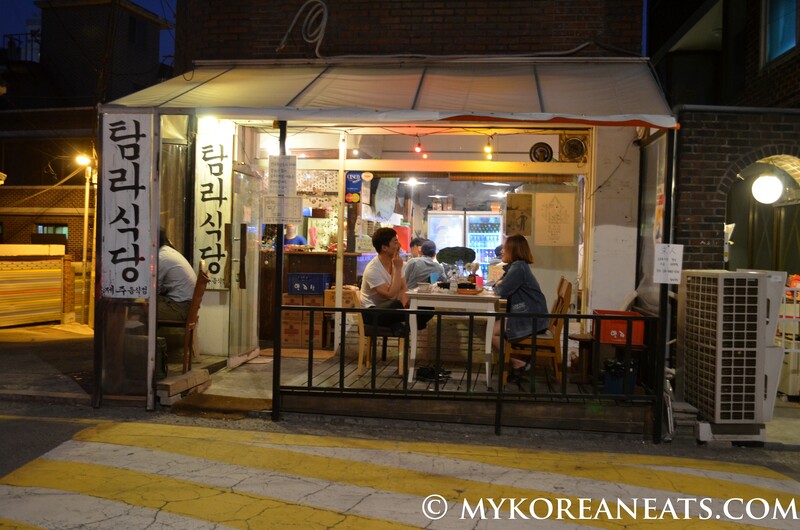 Seating capacity of about 20 people, it’s a charming place with a cozy atmosphere. 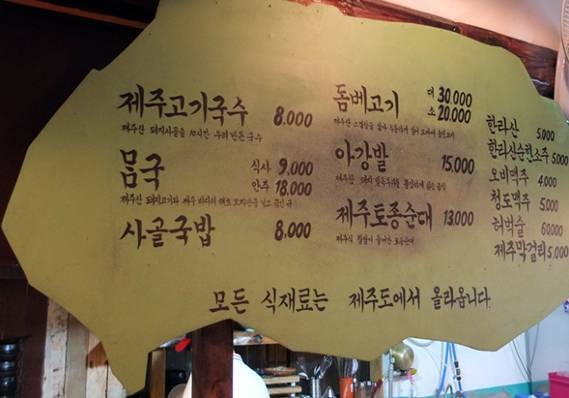 Menu in the shape of Jeju Island. Just a fair warning, there will be a wait during peak hours.